I used TJ Shimmering Bliss Sprays to create this updated Antique Glimmers technique. This technique is described in my blog post -- click on the highlighted word to take you to that blog post. I used my Embossing Buddy and then stamped the TJ verse AS Though I Had Wings with my MISTI so I could be sure every letter in the verse was nice and inky black. 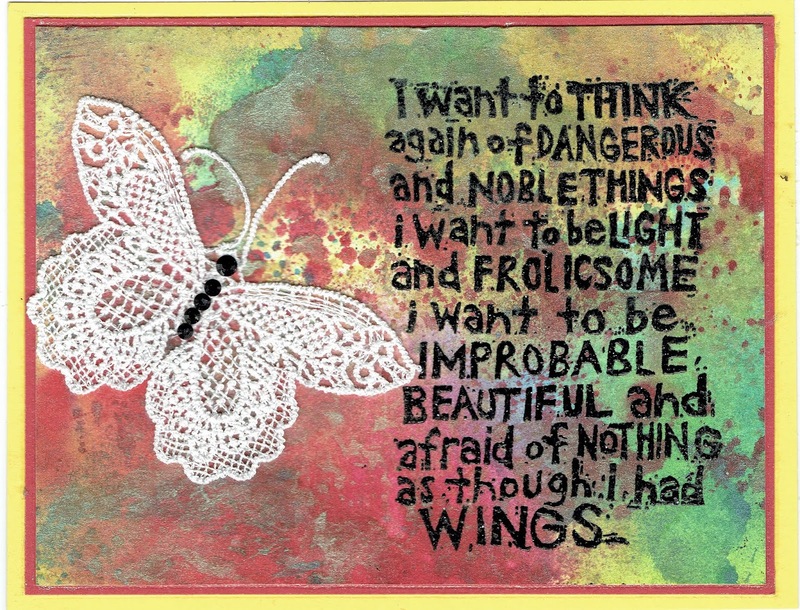 The lacy butterfly was just the perfect embellishment! It is a sticker! Be sure you check out the Technique Junkies Shimmering Bliss Bundles! Be sure to save yourself come money by using the code TJ10Judy when you check out. You will save 10% on your order. This birthday card was created using the beautiful Technique Junkie stamp Wolf by Moonlight and the verse from the TJ stamp Live in the present. You will notice I only used one line from the stamp! 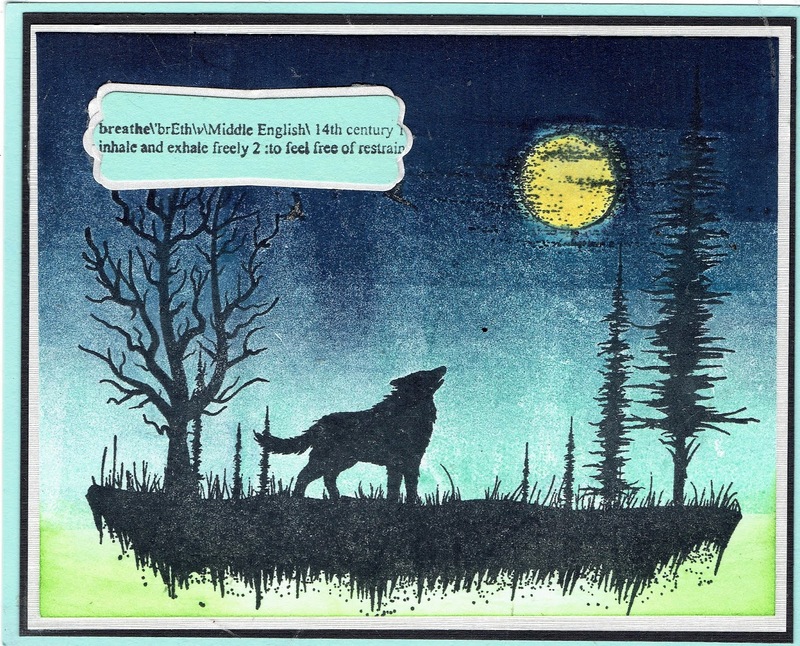 Both the verse and the wolf stamp were inked up with the new Alcohol Lift ink and then stamped on glossy card stock. Various shades of alcohol ink on a blending tool had been applied to the glossy stock. Doing so removed the ink and then I stamped the stamp on plain card stock. As you can see the image transferred. Isn't that cool! This new piece became the inside panel of the card. I stamped the verse from Grand Greetings. My son will love this birthday card next month. Want to have some savings on your order? Use the code TJ10Judy as you check out to save the 10% on your total order. May your day be adventurous and you are able to get inky! The background panel was created with an Updated Antique Glimmers technique with Shimmering Bliss sprays as described in this blog post. 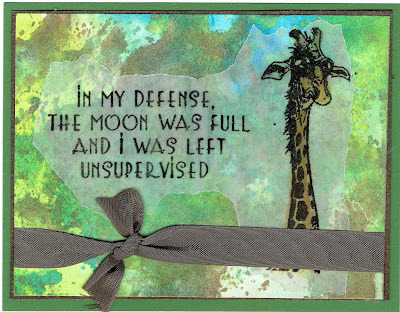 I stamped the giraffe from Why Fit In and the verse Left Unsupervised on a piece of vellum. Both are Technique Junkies stamps. The torn vellum panel was adhered with adhesive from my Xyron machine. Please save 10% by using this code - TJ10Judy - as you check out as you finish shopping. 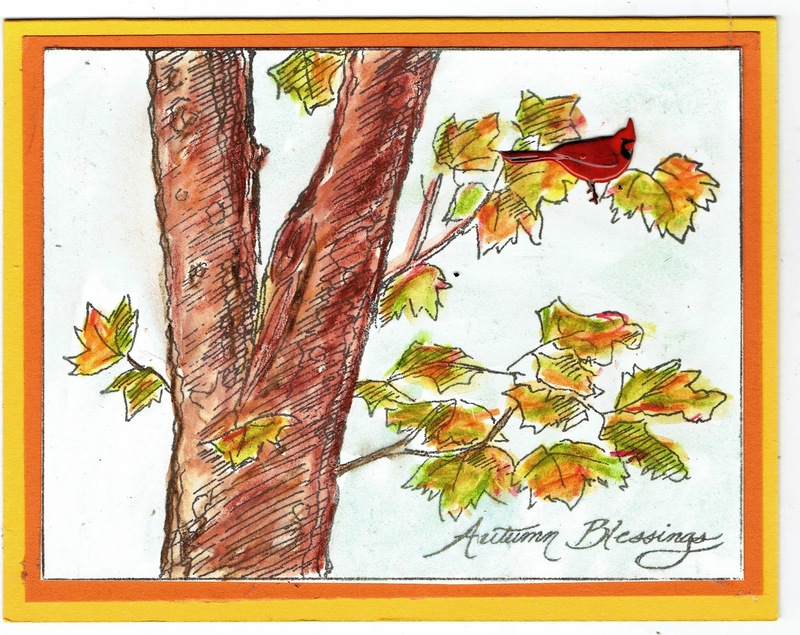 This beautiful TJ Autumn Blessing card is painted with watercolor pencils. I added a cute cardinal brad to the branch of the tree. The sky is painted with Ocean Depth Shimmering Bliss Sprays spritzed on my craft mat, and then applied with my water brush. Please save some money by adding the discount code TJ10Judy to your order. Great way to buy! Have a terrific day, and get inky! Sometimes a simple card is all you need. This is just a fun, fun stamp. I don't know too many people who at one point in their life have not felt like they needed to lose some weight. An I know this message is just how they felt! 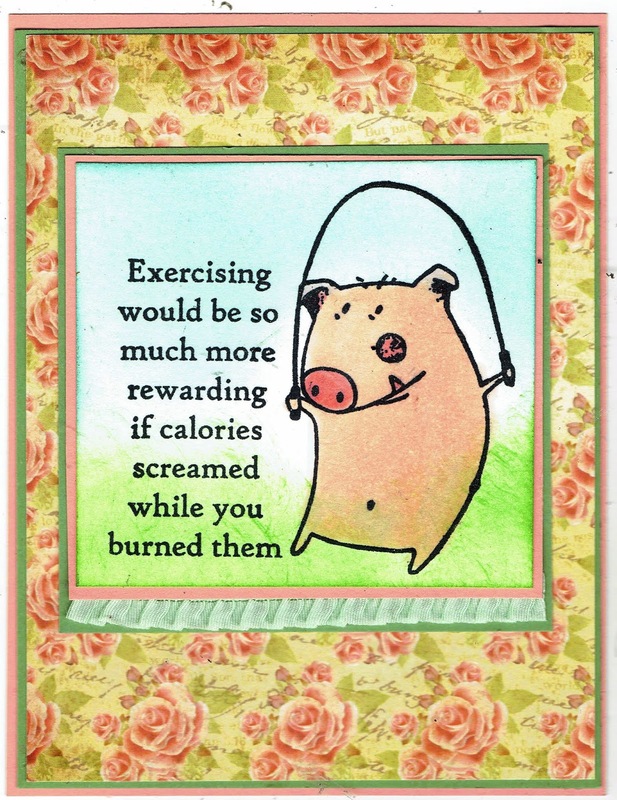 I used Technique Junkies Screaming Calories to create this card. I used Copic Markers to color the pig and sponged the grass and sky. Don't forget to use TJ10Judy is the coupon box when you check out to save 10% on your total order! Have a great day getting getting inky! 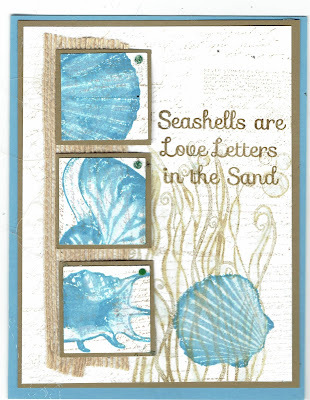 To create this card, I used several Technique Junkies stamps: French Text, Seashells, and Seagrass. I stamped French Text on the background, and then the Seagrass on top of it in beige ink. 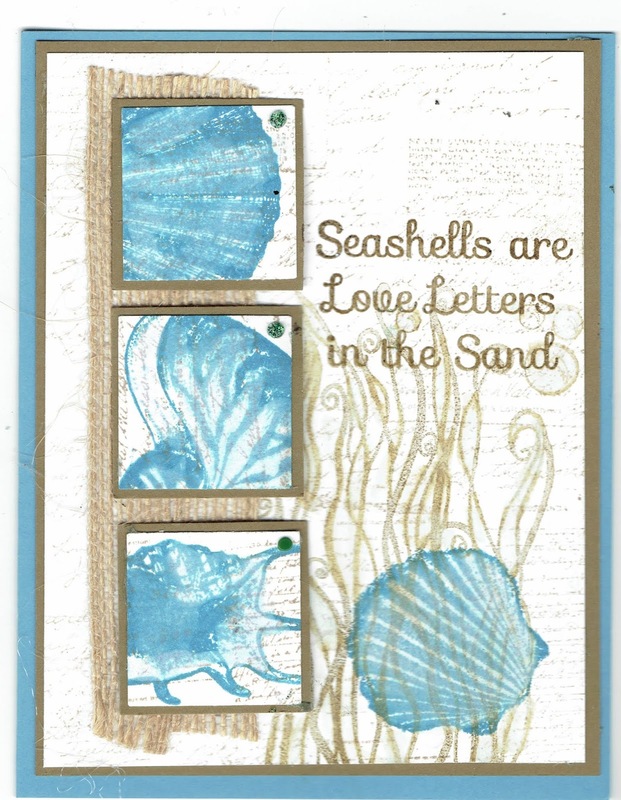 Then, on second piece of white paper, I stamped French Text again, and stamped three of the sea shells in teal ink, leaving space so I could cut them out in small squares. Then I punched out a mat a tiny bit bigger. I affixed the squares in to a strip of burlap ribbon, starting with the middle square, and stamped an additional shell on the card, over the seagrass. The verse is heat-embossed. I added a dot of Nuvo glitter drops in the top right corner of each shell square. 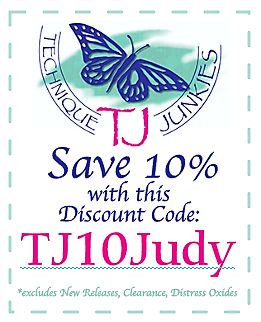 Saving money when you shop is fun, and you can save 10% off your order in the Technique Junkies web store when you check out with the code TJ10Judy. Have a beachy day and get inky! 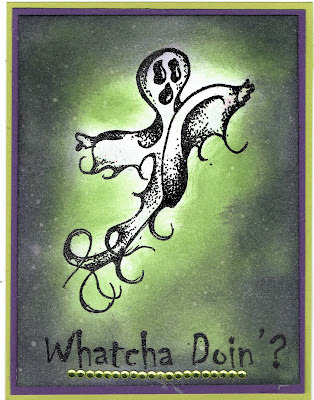 This cute little Ghost and the verse Whatcha Doin'? 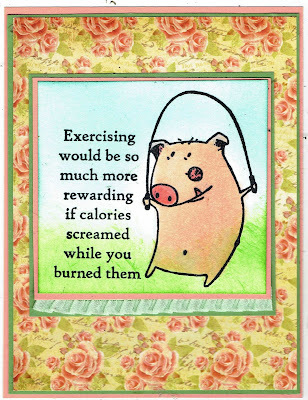 make the focal point for this card. I then sponged on a light olive ink all over the card front framing the ghost. I added deep purple ink over the top of that. Then I spritzed Dazzle Shimmering Bliss sprays to add some reactive qualities and some pale shimmer. The addition of some lime rhinestones add dimension to the card. Remember to use the code TJ10Judy to the your order to gain a 10% discount off your total order. Good morning everyone! 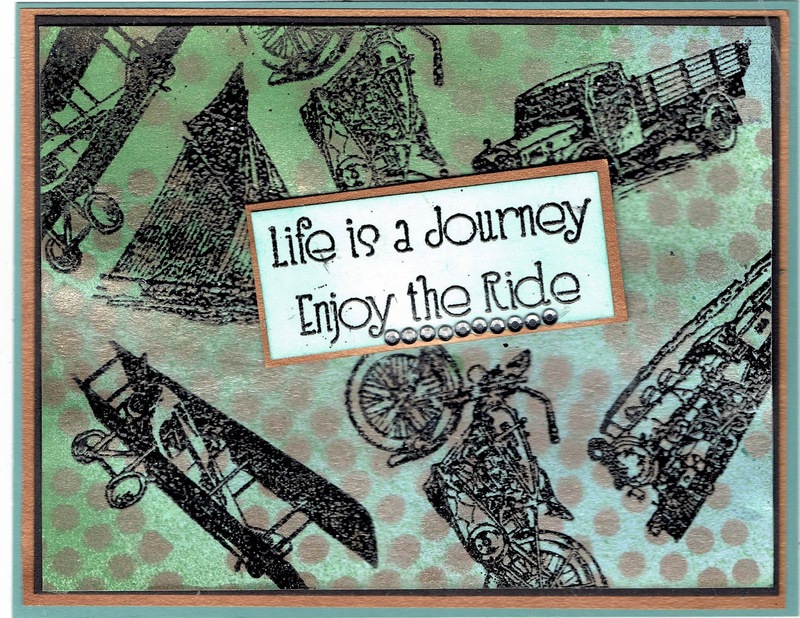 Today's card uses the Technique Junkies stamp set Enjoy the Ride. I sprayed white card stock with Ocean Depth and Luscious Lawn Shimmering Bliss sprays. I placed the Circles Make Circles stencil from A Colorful Life Stencils on top. I sprayed Harvest Sunset Shimmering Bliss spray through the stencil. I stamped the various modes of transportation randomly over the panel with black Versafine ink in my MISTI until I was happy with the ink applied. Then I heat embossed with detail black embossing powder. 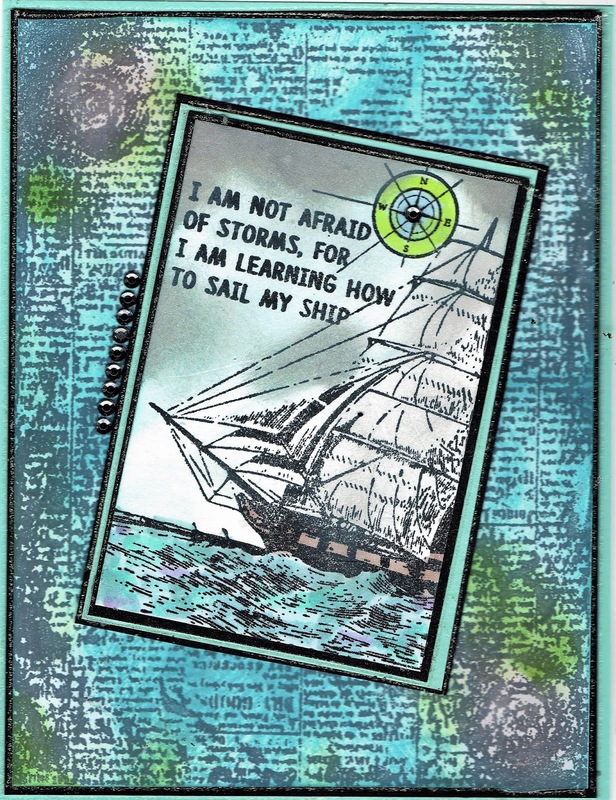 I spritzed the small panel for the verse with Ocean Depth Shimmering Bliss spray, stamped the verse and heat embossed. I used metallic paper to add the borders since it matched the spray. Enjoy shopping knowing that you can get a 10% discount with my code TJ10Judy! Have a wonderful day, and get inky! Bit by bit, I am getting caught up on all my stamping! This little owl from TJ Perk Up Soon is so cute and makes a great get well card. I colored with Copic markers. I paired with some floral background paper and added a detailed embossed die cut sprayed with TJ Shimmering Bliss in Thulian Pink! Don't forget to use the code TJ10Judy for a 10% discount on your entire order when you enter that code as you check out! Great savings! Have a wonderful day, and get inky!! I love stamping, don't you? I love the creativity of this craft. 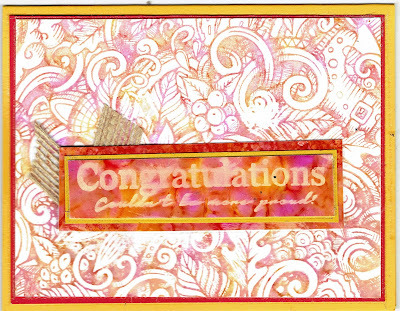 I enjoy seeing how you can combine stamps to create a lovely card. 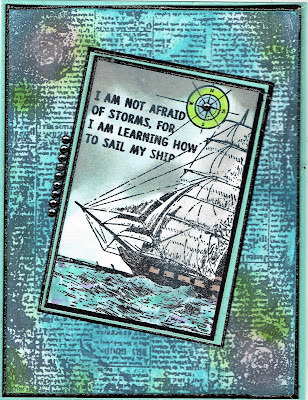 For this card I used Technique Junkie stamps Learning to Sail and Textured Newsprint to create this card. I sponged blue ink over the newsprint and used sponge daubers for the flowers, leaves, ship, sea, and sky. Then I used my Art Nuvo Glitter Gloss Aqua pen to add simmer here and there. I used a Copic marker on the compass. 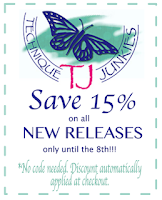 Remember you can get 10% off your entire order from the Technique Junkies website by using the code TJ10Judy! Have a wonderfully creative day -- and get inky! I love techniques. It is what drew me to Technique Junkies in the first place. So when Tim Holtz came out with a new product this year called Alcohol Ink Lift, I knew I had to have to have it. 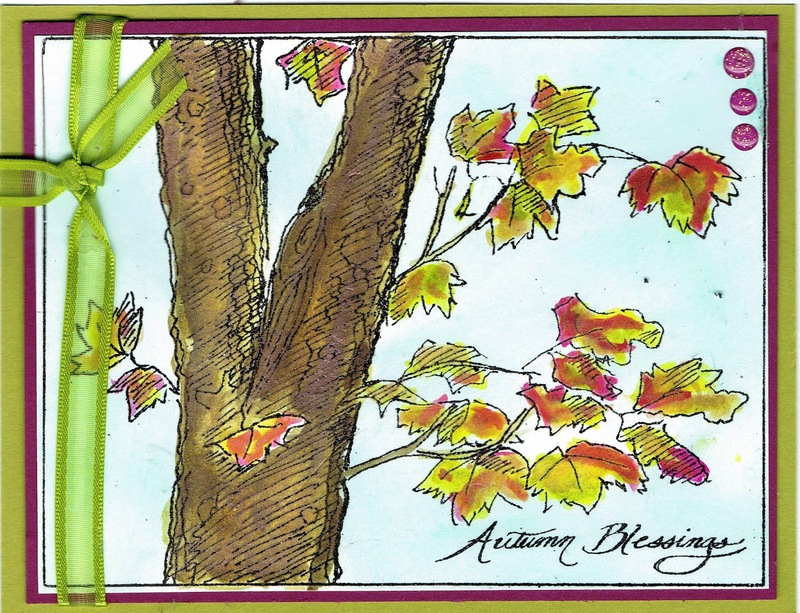 I used a variety of fall colors of alcohol inks on a blending tool on glossy paper. 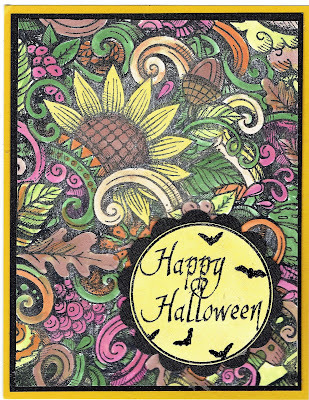 When it was DRY (I heat set it) I applied the alcohol lift ink to the TJ Autumn Doodles stamp and pressed it down over the alcohol ink on the glossy paper. I used the Misty so I could get good even pressure because of my recent shoulder surgery. Then this is the FUN part! 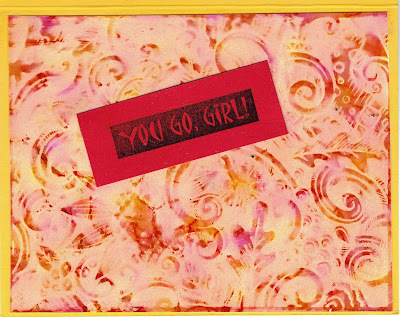 I then applied this stamp to a sheet of Neenah Classic Solar white card stock in my Misty - and TA-DA! The image transferred. The transferred image (above) became the front of the card, and the "lift off" piece became the inside piece. Isn't this a cool look! 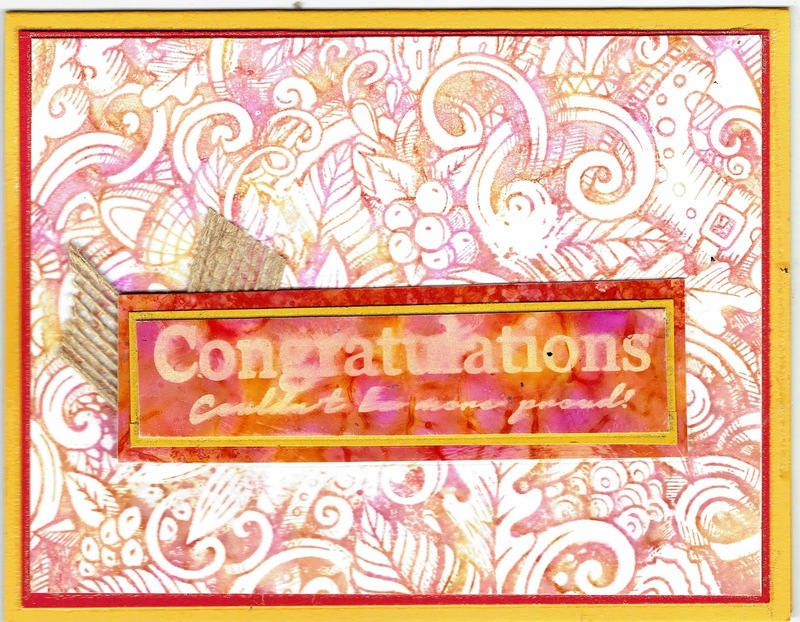 This card was mailed away to my niece who just graduated with her Bachelor's in Nursing. So proud of her! The verses are from Technique Junkies stamp sets Grand Greetings and Simple Sentiments 2-a. Now this is an important day - do you know why? This is the last day to get the automatic 15% off automatic discount on all of the September Release stamps! Have you shopped yet? Don't let this deal pass you buy! And you can double your discount with my personal code TJ10Judy which gets you 10% off of everything else on the TJ website! So then happy shopping! and get inky! When I saw this Ephemeral Crow stamp I knew I wanted it. My first thought when I saw it was the quote from the poem The Raven by Edgar Alan Poe. 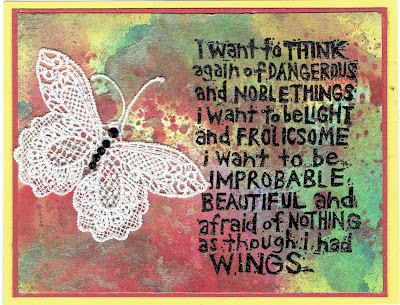 So I took this quote and typed it out using vellum to print it on. It is NOT a stamp. I ran the torn vellum through my small Xyron machine for the adhesive. The Technique Junkies background stamp is called Old Wall. I added color by using sponge daubers and dye based inks. I wanted a soft look to the card. I spritzed the raven lightly with Dazzle Shimmering Bliss. It is a fun card. Please remember than you get a 15% automatic discount on every single September release stamp through September 8. And you can a 10% discount on everything else using the TJ10Judy code when you check out. A double bargain for now! But that ends at the end of September 8. You can still get the 10% the rest of the month however. It's a great shopping day, so get inky! For Sale!! Stamps! Some with Matching Dies! Bigz Dies!! Punches!! I am down sizing in several rooms in my house. I have quite a small room for my stamp/craft room. I must create more space for storage. Therefore, I have gone through my stamps, dies, and punches and decided what I can get rid of and YOU will be the beneficiary of my purging! All of those things in the title are for sale in Grab Bag Priority Flat Rate Mailing envelopes or medium boxes. Every flat rate envelope has 2 Bigz Dies. Every Priority Flat rate box has 3-4 Bigz dies. 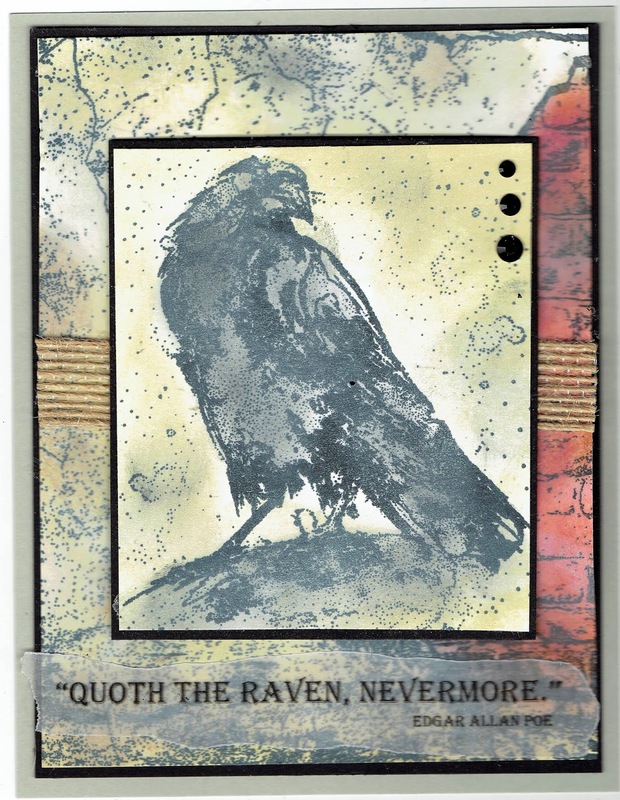 Some are "plain" Sizzix and some are Tim Holtz dies. Each box would easily have a value of over $150. The envelopes would have a value of at least $75. Every box will have a variety of stamps. No box will have all Stampin' Up stamps. There are seasonal stamps - fall, spring, Winter, and Christmas. There are background and shadow stamps. I tried to put some in each box. I tried to make sure every box has one of those seasonal stamps in the box. Every box will have a selection of word stamps -- just words. Almost all of the stamps are in plastic bags. The few stamp sets with matching dies are in a Stampin' Up DVD case. All stamps are clear mount for acrylic blocks. Most are red rubber (or purple or blue rubber)) and some are polymer. Some have the index on the back of the stamp and some do not. Every box has at least 2 punches. There are a variety. The priority envelopes have no punches because of the size. 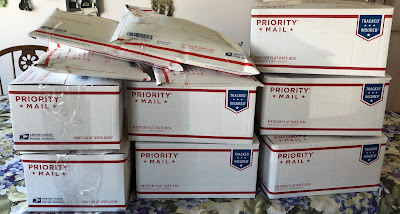 I have jam packed every box and every envelope with as many stamps as I could cram in there. You can see the bulging of the priority envelopes! Each box or envelope is taped securely so that things will ship to you securely. This is a smoke free and pet free home. I only ship to the United States. The cost per priority box or mailing envelope includes the shipping. I only accept Pay Pal. Please send a comment below and I will respond to you privately with my Pay Pal email address. Send me your email address like this to protect your email from spam - youraddy at email dot com. The priority flat rate mailing envelopes are $22.00. The Priority flat rate medium size boxes are $50.00. I will let you know when I ship your package to you. I do believe all buyers will be pleased with their purchase. Happy shopping day to you!!! This is gorgeous card in person, I wish you could see all of the shimmer! I used Technique Junkies Autumn Doodles and Circle Halloween to create this card. But the fun is in the shimmer! Normally painting this much detail in all of the doodles takes a lot of time but this painting went very quickly! I did not use water colors to paint! I used Technique Junkies Shimmering Bliss sprays and a water brush. I spritzed a small amount of spray on my craft mat and painted away. Hence all of the delicious shimmer all over this card. While I own quite a few of the colors I do not own a yellow spray -- YET!! I will soon. So I spritzed some Dazzle on my craft mat and added a drop of yellow reinker! I used the same think on the circle tag to create the yellow for the moon of the verse! Remember you can get an automatic 15% off of the September Release stamps through September 8. And then you can get another 10% off of everything else on the TJ website with the code TJ10Judy when you check out! What a double bargain! Happy shopping, happy crafting, happy day, and get inky!! Lovely September! 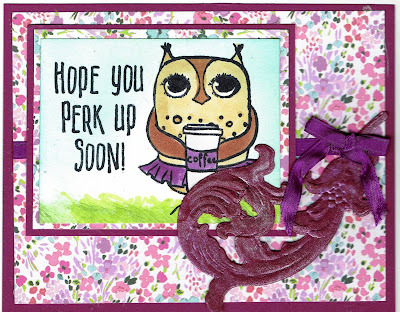 Happy Blog Hop Day with NEW Stamps! Did you know this is an exciting day? 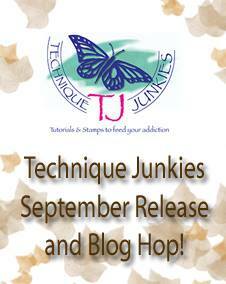 It is Technique Junkies September Release Day through a blog hop! You will want to be sure to hop through TJ Design Team blog hop. The stamps this month are very cool indeed. If you didn't start at the beginning you will want to start here. The entire Blog Hop line up will be posted here right at the beginning of the Technique Junkies Blog Hop. And all of the September Release stamps can be viewed here. One of our new stamp designers is the wonderful Jan Tinklenberg - and she has a blog post as well on this Blog Hop. So exciting! She is second on the hop. Be sure to see her blog. You should have come to me from Ro Donner. Isn't she creative? 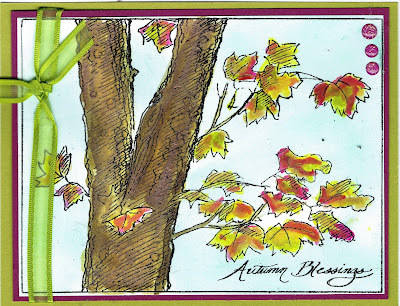 My first card uses Technique Junkies Autumn Blessings. I used Twinkling H2Os to watercolor the beautiful image. And I sponged in the sky with blue ink. My second card uses two new releases for Technique Junkies: Ephemeral Crow and Textured Newsprint. I sprayed the background with Ocean Depth Technique Junkies Shimmering Bliss Spray. Then I used sponge daubers with dye based ink to add the roses and leaves. 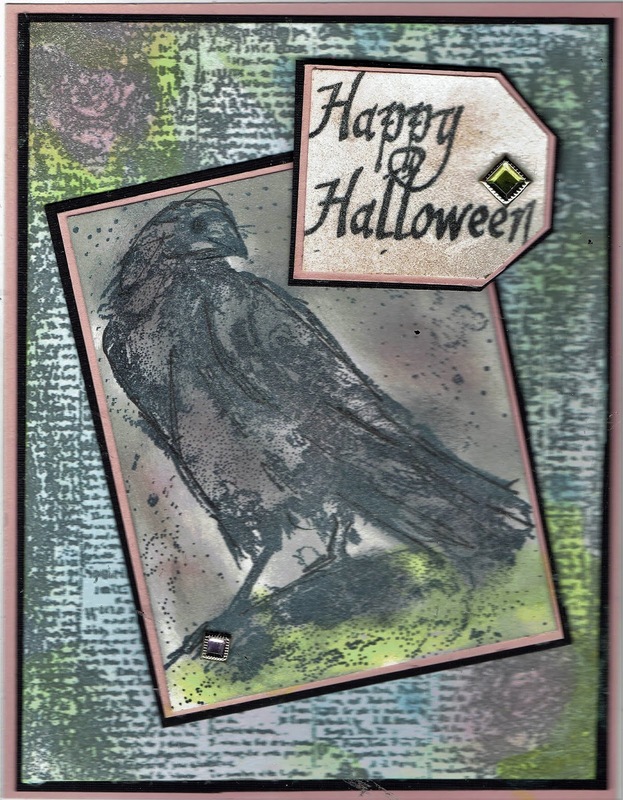 I used sponge daubers and ink for the Raven as well. I spritzed the crow with a light spray of Dazzle Technique Junkies Shimmering Bliss spray. The verse is from Technique Junkies Circle Happy Halloween. 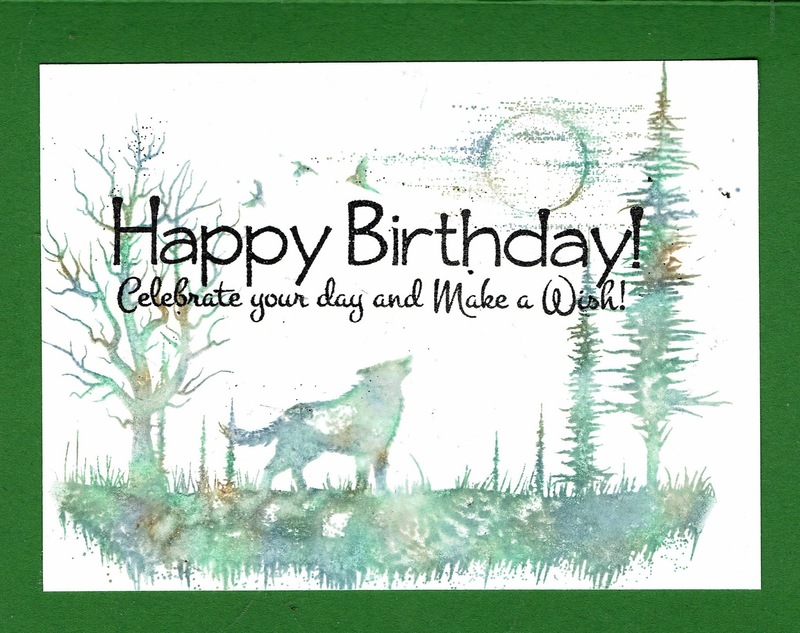 My last card uses the lovely new Wolf by Moonlight stamp from Technique Junkies. It is a silhouette. I punched out a tiny circle shape from a post it note and masked off the moon and then used a brayer over the stamped image with about 4 shades of blue ink to create this night sky. Then I used a sponge dauber to color the moon. Green is sponged for the grass. 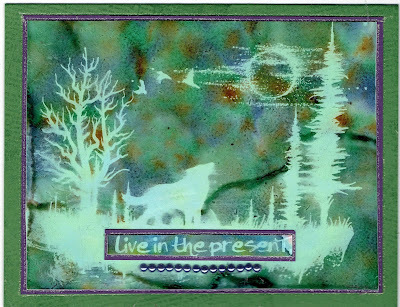 The verse comes from the Technique Junkies stamp set called Definitions. 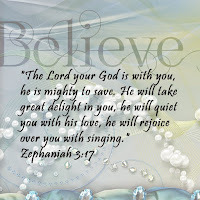 From my blog, you hop to the very talented Beth Norman's blog. You will enjoy her projects. There is a wonderful collection of stamp in the Technique Junkies September Release. And as always the September stamps are 15% off (no coupon needed!) through September 8. And you can get an additional 10% off of everything else by using the code TJ10Judy! Have a great day -- get shopping, and get inky!